WASHINGTON — White House press secretary Sarah Sanders on Wednesday defended President Donald Trump's campaign-rally attack on Christine Blasey Ford, the college professor who told the Senate last week that Supreme Court nominee Brett Kavanaugh sexually assaulted her when they were teenagers. And Sanders refused to say whether Trump still thinks, as he said last week, that Ford was a "very credible witness." Speaking to reporters at a rare briefing at the White House — her first since Sept. 10 — Sanders rejected the characterization that the president had ridiculed Ford during a political event Tuesday night in Southaven, Miss. 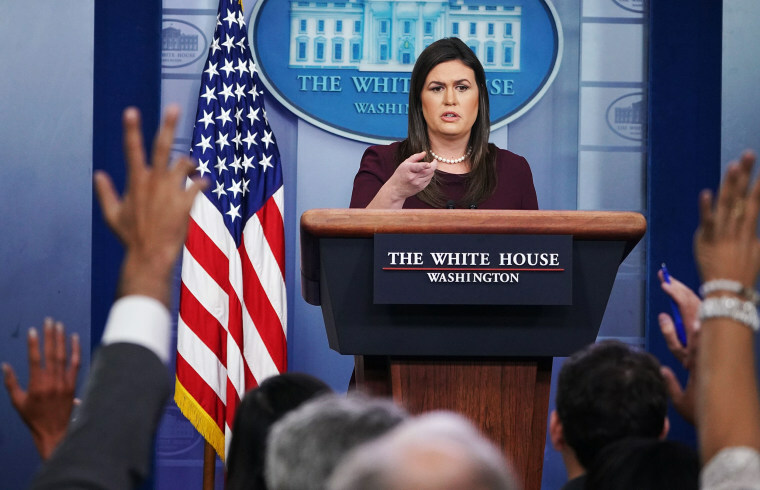 "The president is simply putting out the facts of the matter," Sanders said. Her remarks fit into what appeared to be a broader White House strategy to echo the president's sentiment while backing away from his tenor. Earlier in the day, Trump adviser Kellyanne Conway groused that Ford had been treated "like a Fabergé egg by all of us." "When did he say she was not credible?" Conway asked. "He said there were factual inconsistencies. He laid them out for you. Don’t put words in the president’s mouth." But Republican Sens. Susan Collins of Maine, Lisa Murkowski of Alaska and Jeff Flake of Arizona — key potential swing votes whose objections to Kavanaugh's quick confirmation led to an additional FBI background investigation this week — all condemned the way Trump talked about Ford. "I think the president’s comments yesterday mocking Dr. Ford were wholly inappropriate and in my view unacceptable,” Murkowski said Tuesday, noting that she is "taking everything into account" as she determines whether to vote to confirm Kavanaugh to the high court. Sanders accused Democrats of having "undermined our entire judicial branch" with their response to Kavanaugh's nomination. Asked whether she was arguing that Kavanaugh was the victim in the debate, Sanders said he was one of them. "I think both Dr. Ford and Judge Kavanaugh are victims at the hands of the Democrats," she said. Republicans control the Senate by a slim 51-49 vote margin. It takes 50 votes — along with Vice President Mike Pence's ability to break any potential tie — to confirm a Supreme Court nominee. Senate Majority Leader Mitch McConnell, R-Ky., was forced to delay a vote on Kavanaugh until at least this weekend after the Senate Judiciary Committee heard testimony from Ford and Kavanaugh last Thursday. Flake voted to approve the nomination in committee and send it to the Senate floor, but in doing so, he successfully insisted that the FBI conduct interviews of potential witnesses who had not appeared before the committee. The FBI is expected to wrap up that investigation soon.